Sony's Pro Audio department has a real winner on its ears with the MDR7506 large-diaphragm foldable headphones. These 'phones have everything a musician needs for the studio or on the road. The excellent Sony sound quality is there, with smooth frequency response from 10Hz to 20kHz. Closed-ear design gives you great comfort for long sessions, exclusion of external noise, and no leakage for when you're recording. But that's just the stuff you'd expect - the MDR7506s are also supremely rugged and collapsible, making them the most road-worthy of headphones for DJs, drummers playing to click tracks, engineers, and others. A soft carrying case comes supplied. Stereo Unimatch Plug with 1/4" and 1/8" applications. Gold Connectors and OFC Cord for reliable and stable signal connection and transmission. zZounds is an authorized dealer of Sony products. Plug-type: Stereo Unimatch plug 1/4" and 1/8"
Sound: These cans are very accurate, with a slight pump in the low end. They work well for mixing a live venue, or studio work. And at less than $90 bucks a pop, you'll be able to buy plenty of them for all the musicians if you're planning to have a small band of five or so people use them for monitoring instruments, or vocal tracks. There's a little leakage (more so if someone has a phobia about wearing them on both ears); but nothing that can't be controlled with a few tweaks on the compressor gating adjustments if needed. Feature: They have the standard 1/4" phone jack spin-off over top of the 1/8" mini plug, and collapse down nicely into a tight package for storage. Quality: As an example of the build quality, I can say that I've had at least four pairs of the 7506's for OVER TWENTY YEARS. They have been exposed to many different musicians over the years in the recording studio, and the only things I've replaced are the earpads. In fact, I just replaced the earpads on my oldest pair (22 years old) two days ago, and gave them to my 13 yr old son. He couldn't believe how pristine looking they were, and how incredible they still sound. I told him that was because I always made people sign a form saying if they abused (or broke) any equipment while at the studio, they were responsible to pay for it. Plus, in the last five to six years I always referred to them as the 'vintage studio headsets'. That, in itself, always made people respect them. Only one person ever threw a tantrum while recording (as well as threw the 7506's across the room onto a sofa), no damage. Value: The price of these headphones is exceptional. Overall: If for some reason one of my six sets of 7506's should fail, I would replace it with same. It's a no-brainer. Sound: SOunds much better than any other set of headphones I have ever used. That includes some of the cheaper Sennheiser's and anything by Koss, Stanton, and Gemeni. Great bass and clear highs. Never had any distortion come out of these badboys either. Feature: Comes with a bag and a screw on adapter for 1/4" headphone jacks. Keeping it simple is key with me. Ease of Use: Plug it in and go! Quality: The soft ear pads feel great, and they don't shred to pieces when they get a little wet from sweat. I can use them working out and not having to worry ruining them. I am not a big fan of needing to buy new sets of things yearly, especially when they cost over $100. I've had mine for a little over 6 years now, and they barely show any wear. The Wow Factor: Comfortable and loud, enough said! 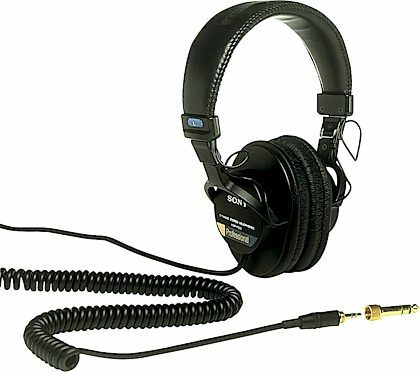 Overall: I am about to buy a new set of these headphones. I figure that the life of these, for as much as I use them, to be right around 5 years. Mine have gone above and beyond the expectations that I had for them when I bought them. As long as Sony continues to make them I will buy them. There is not another model for me. They have worked for me cutting the grass, working out, in the airport and on planes, and going from my bedroom to friends houses for DJing fun. In my opinion it is the only Sony product I have owned that is this great. Style of Music: Detroit Techno, House, High Tech Soul, Rock, Heavy Metal, and Rap.